January | 2013 | Get Glenn Mobile! While mobility is my primary goal at this point, I’m always happy to find ways to recover other things in my life taken from me by MS. I’ve mentioned how liberating the acquisition of my Asus tablet PC’s been (I haven’t even begun talking about the restoration of my ability to play FPS combat games again using the Android paradigm! ), but occasionally I’ll find something that will add another piece to the puzzle. This week saw one of those somethings. Among other cognitive issues the flavor of multiple sclerosis I have brings, a particularly annoying one was the loss of almost all hunger signals telling me I’m hungry for the past several years. Yep, that means never having an appetite, a sore blow to my normally sensualist/hedonist appreciation of life; I’ve had to recognize I needed to eat by the logy, vague thinking and gloomy attitude that accompanies it. Well, for whatever reason I’ve been hungry again for the past few weeks, actually enjoying eating foods I like and experiencing those missing hunger signals again. When my mom got a wild hair recently and ordered some steaks from Omaha Steaks, I decided I’d like one…it’s been years since I’ve indulged. Part of the reason for this is the lack of hunger signals I’ve mentioned but there was another reason, a dealbreaker until it was addressed: I’m left handed and my left hand’s lost about 90% of its function. Cutting up a piece of food is an exercise in futility. Try it sometime and you’ll see…there’s no reliable way to do this using one hand (especially with your non dominant, or weak hand! )…it was obvious I’d need a new adaptive aid to be able to do it. A quick search introduced me to rocker knives, and it was soon clear that one of the better ones is available from good old Amazon inexpensively: the Alaskan Ulu Knife. 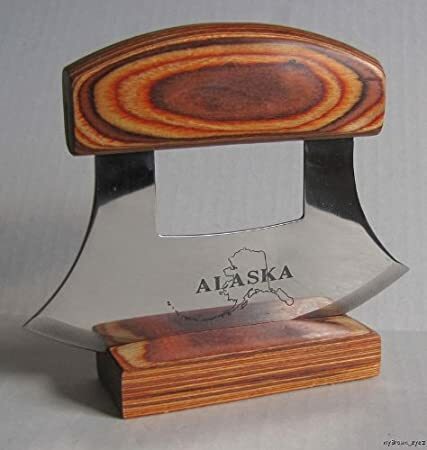 It’s made in Alaska, looks attractive with its laminated wood handle and base and appeared likely to fill my need, so I jumped on it at just twelve bucks. This thing’s a marvel of low tech! I found I could almost effortlessly cut a piece of steak with precision. The mass of the blade pins the meat down and won’t allow it to move, while the curved blade doeas the cutting as you rock it forward or back. I highly recommend both of these items to make a real difference in their ability to enjoy life. Now, I’ve read any number of accounts of disabled people like myself who simply resigned themselves to eating food they could manage with conventional utensils. I can’t understand why that should happen in this day and age when a few minutes’ researching will solve their problem as it did for me. Yet again we see how the market is always there to fill a niche created by consumers’ need or desire…a postulate the Keynesians never have understood and probably never will! A happy New Year, all! 2012’s come and gone, and we’ve seen some pretty impressive progress over the year made with this fundraiser…over $9000 raised is not a bit shabby! A year ago I was still trying to establish this blog and project in its legitimacy, credibility and visibility. It’s certainly come a long way since then, and I’ve been delighted by peoples’ response, both those who contributed so generously to the fundraiser as well as my friends who went to the trouble of making all the great endorsement videos to help raise awareness of my cause with the public. Besides this, I’ve been writing my opinion column for the American Daily Herald, though lately my output’s been dismally low with so many factors working to siphon my limited energy off. Besides the physical limitations my MS has bestowed on me, the exceedingly low energy resulting from my central nervous system running so inefficiently is one of the most infuriating aspects of the disorder. I’m still doing online broadcasts with my partner Donald Rutledge in our Freedom Finders show, though we’ve had to move to another network owing to the Truth Finders Network owner allowing the site to decline. We can now be found at WeROAR, an excellent site operated by the very competent April Reigne. Thanks for the opportunity, April (hopefully we’ll get the broadcasting software issues resolved quickly), we’re really pleased to join the WeROAR family! Assuming we solve those annoying software glitches, you can catch the show live at WeROAR on Wednesday and Thursday evenings from 9 PM Central time to 11PM Central. As I’ve detailed before, these days I’m learning to work in the Android system since my mom thoughtfully provided me with an Asus TF700 Transformer Infinity tablet PC as an early Christmas present. It shouldn’t come as a surprise that by the holiday’s arrival the tablet was living up to its Transformer name with the addition of an Asus docking keyboard. It’s a great complement to the Infinity, turning it into something like a tiny netbook. This unit surprised me since I’ve found that while the Android OS is still developing and can be a bit clunky sometimes, it really can do most of the things a desktop PC can do. I’m composing this entry using it, and can do so from anywhere in my home or even outside in the driveway using the WiFi connection from my wireless router. That’s mighty liberating, believe me, and I’m excited to know that once my mobility’s been restored, I’ll be able to publish on the road using any open WiFi connection! With the dismal winter weather and the holidays behind us, this is the deadest part of the year. I’ll be ready for spring, though, and I’ll be doing everything I can to increase this blog’s visibility so we can make 2013 a lucky number indeed, the year that sees the completion of the goal to Get Glenn Mobile!